Argentina has historically had some problems with inflation. Official government estimates, for example, put the most recent 12 month period at a rate of 10.9%. Independent estimates say that number is likely closer to 30%. In short, this means that a trip to the grocery store that cost $100 a year ago costs $130 today. That’s a pretty big jump; for comparison, the annual rate of inflation in the United States over the past decade has usually been in the 1.5% to 3.0% range. There are many consequences of this high inflation rate, but the important one for this blog post is that it creates distrust in the local currency as a store of value. 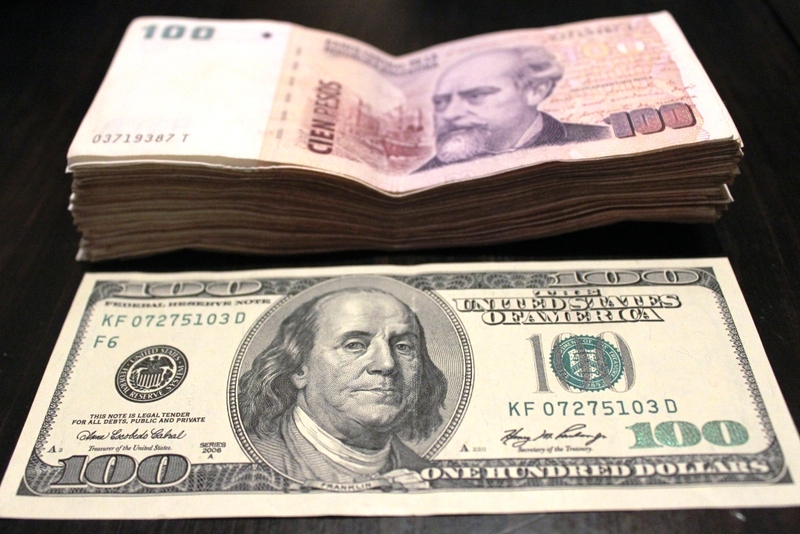 As a result, Argentines have something of a love affair with holding foreign currencies, especially the US dollar. For a long time, currency was exchanged freely. Argentines were able to buy and sell dollars as they pleased. In 2011, however, the government enacted restrictions on exchanging pesos for greenbacks in an effort to reduce capital flight and instill (read: enforce) confidence in the peso. Since that time, citizens have been essentially barred from obtaining dollars, and the only legal way to sell dollars one might bring into the country was at an official exchange house using an official exchange rate set by the government. In practice, however, enforcement on the selling of dollars has been quite lax. A parallel market sprung up, called the blue dollar (dolar blue). The open market has valued the dollar at a much higher level than the official one – buying dollars at the blue rate has generally been around 40%-50% more expensive than at the official rate. What this means as a traveler is that if you have the ability to bring dollars into Argentina, you can get up to 50% extra buying power by selling your dollars on the blue market; a meal that costs you $30 in pesos you pull out of an ATM would only cost $20 if you had brought in greenbacks and sold them on the blue market. This really makes everything a whole heck of a lot cheaper and turns a place where using dollars would be somewhat expensive compared to other countries in the region into one that is fairly inexpensive. Argentina is the only place I have ever been to where “Bring as much cash as you can” is healthy advice to give a tourist. Many private individuals want in on this action. A Facebook page has even been created, where 22,000 fans offer to buy and sell pesos and dollars. During our week in Córdoba around New Years, our hostess’ boyfriend was more than happy to give us ten thousand pesos for one thousand dollars, an exchange rate of 10 to 1 (the official rate at that point was around 6.1). Exchanging with a trusted person is the safest method, but if you can’t find one of those, try looking for casas de cambio (“exchange houses”) or cuevas (“caves”). In Buenos Aires, a slew of these operate on Calle Florida, a pedestrian shopping street. Each block on this street is home to a dozen or so people calling out their services: “Cambio! Cambio! Cambio! Dolares! Euros! Reals!” Rumor has it that these exchanges will sometimes try to slip in counterfeit bills, so do some research before you go. To cover our eleven weeks in Argentina we brought $5,000 dollars with us (we don’t have it anymore, so don’t worry about trying to rob us) from Bolivia, where we were able to withdraw them from an ATM. Even our landlords here want to be paid in dollars. I have never carried so much cash for so long. Brianna separated it into ten different stacks of $500 and hid those throughout our belongings to diversify our risk a bit. After selling our first grand in Córdoba for 10 to 1, I walked down to Florida one morning with another $1000 in my pocket. It was a twenty minute walk, and my left hand remained in my pocket firmly grasping the stack the entire way. I walked up Florida once, checking out the scene, trying to decide where to go. Eventually I decided to stop at a middle-aged lady advertising her services. She led me into a commercial building where a man behind some bullet-proof glass quoted me at 10.5 to 1. Awesome! He buzzed me into a private booth where we completed the transaction. I thumbed through the fat stack of pesos he gave me, looking for watermarks and magnetic strips – apparently some counterfeit bills are known to sneak in from time to time. And that was pretty much it. Walking back I stopped every few blocks to lean against a wall and scan the street. It was pretty evident early on that nobody was following, and yet I continued to do this the entire way home. A couple weeks later we were starting to think about needing more pesos. When I checked the rate online I realized that over the past week it had been steadily climbing and had reached 12 to 1. Whoa! By that afternoon it had reached 13. Our remaining $2500 had gained in value by over 30% since we had entered the country. We were on cloud nine with the knowledge that we had essentially gained around $750 in buying power out of thin air. This was a Thursday, so I was booked through about 2:00PM meeting with a client. At 1:00 our power went out (our second brownout from the heat), so we ended up at Starbucks. After my meeting was over, we decided that since it was the hottest day we had yet to encounter in Buenos Aires, it might be nice to wait until Friday morning to do the exchange instead of walking through 100 degree weather only to come back to an apartment without working AC or even a fan. Besides, how much could it really drop by the next morning? On Friday I got up, stuffed $2500 in my pocket and walked back down to Florida. After having a great experience the first time, I returned to the same casa de cambio. The attendant shook his head at me. He said he didn’t have a price for dollars. When I asked why he just kind of shrugged. Hmmm. I tried another casa de cambio a block down. Same answer. They said try back later that afternoon. Arriving back at the apartment I jumped online to see if I could figure anything out. The front page of the Buenos Aires Herald website told me what the matter was. Details were scarce to nonexistent, but that very morning the government had announced plans to relax the restrictions on buying US dollars. The local exchange houses were unsure what effect this was going to have on the blue market, so they had essentially shut down operations while everyone scrambled to make sense of the news. Geezus. The one detail we did know was that in the new plan access to dollars would be restricted by income level, so presumably there would still be a blue market, but where the exchange rate would settle at when the dust cleared was anybody’s guess. There was really no new information through the whole morning. No one seemed to have any clue what was going on. At some point, the exchanges decided they had enough information to set a price and opened again, with the rate having dropped 20% down to 10.5 to 1 once again. Our imaginary $750 had essentially evaporated before our eyes. If only we had gone the day before! Thanks boss. I felt like I was in way over my head when I started researching it…a whole laundry list of how the government has mismanaged the economy starts to accrue. But if you just focus on the blue market itself instead of all the reasons why it is in place and other tangents it makes a bit more sense. Nice tip on the Twitter account. That’s a bit more convenient that searching through the BA Herald. The first column (Compra) of the first line Dolar Blue (Cuevas..Informal) gives you an idea of how much (approximately) you can sell your dollars for. The Oficial (Libre, Blanco) rate gives you the current bank rate for comparison purposes.